It's official: The Eastmoreland Neighborhood Association and consulting firm AECOMA has submitted a draft nomination for the Eastmoreland Historic District to State Historic Preservation Office. Those opposed to the plan, including Liz Dexter with a group calling itself "Keep Eastmoreland Free," said they were concerned, because the neighborhood association "neglected to present it to our neighborhood beforehand, as they had said that they would." The association plans to hold a meeting on the district proposal at 6 p.m., Thursday, Dec. 8, in the Duniway Elementary School auditorium, 7700 S.E. Reed College Place. Dexter pointed out that the Eastmoreland historic district plan proposes to include the Eastmoreland Golf Course, Crystal Springs Rhododendron Garden, Berkeley Park, Duniway Elementary School and seven residential properties owned by Reed College adjacent to their campus. "The city includes these properties in the neighborhood, so they are included in the proposal," said neighborhood association Chairman Tom Hansen. "And, they contribute to the historic nature of the neighborhood." 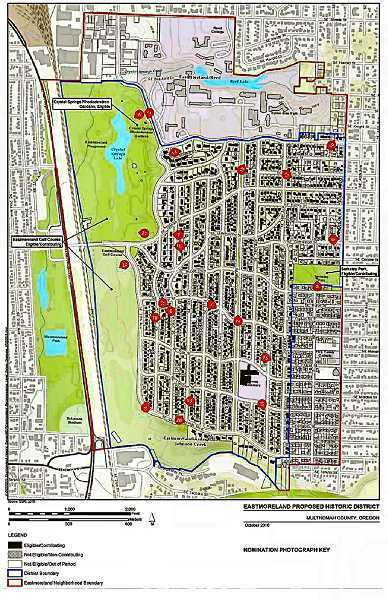 The opposition point out that about 350 homes in the Berkeley Addition (south of Berkeley Park, and east of Southeast 36th Avenue) have been excluded from the proposed district, although they are considered to be within the neighborhood association's boundary. "We'd hoped that the historic district boundaries could be the entire Eastmoreland neighborhood, as defined by the city," Hansen said. "That may not be possible because, over the last 10 years, especially in Berkeley Addition, this area has been disrupted by demolitions and changes. So, it looks as if not enough of the houses remain there that are of an historic enough nature." Groups opposed to the idea also point out that the "'period of significance" is much wider than is typical, ranging from 1910 to 1961 (95 percent of homes in the boundary); yet, the oldest and most historic neighborhood properties — four homes built prior to this period, in 1892, 1907 and two in 1909 — are not protected. "The situation is that the historic district has to be contiguous," Hansen said. "The qualifying area must be a whole, not 'historic pockets.' "
During next week's meeting, neighborhood association Land-use Chairman Rod Merrick said consultants from AECOM would discuss the plan during a presentation that includes Diana Painter from the State Historic Preservation Office, Brandon Spencer-Hartl from Portland's historic resources program and Hillary Adam, responsible for providing design review for properties with historic districts in Portland. "The presentation is very important for all ENA neighbors, especially those living within the proposed boundaries of the district," Merrick said. "In addition to presenting the research findings and the significance of the district in the national context, there will be a discussion of the formulation of design guidelines."